The PM II series of scopes from S&B has been a long time standard to judge other scopes, and we look at exactly why that is the case. One of the most talked about optics topics as of late has been the USMC’s move to adopt the Schmidt and Bender PM LP/2 3-12x50mm scope on all of their M40A3 and M82 sniper rifles. This was quite the surprise as there were scopes provided by 25 companies and the S&B supposedly is the only scope that passed all the tests. No matter what controversies may arise from the testing and the adoption, the fact remains that the S&B is now the USMC’s official sniping scope. The S&B scopes have had a long time reputation of amazing optics and high quality, but the price has always been out of reach for most shooters and even most law enforcement agencies out there. We managed to get an S&B on loan from one of our loyal readers (Thanks!!) and decided to run an evaluation on the scope. The power adjust ring was very easy to grip and did not require a whole lot of effort to adjust, which is actually a little less common than you might think. There is a typical European fast focus eye piece (diopter adjustment), which worked well, and there should not be too much of a problem to use a flip up scope cap once you have the eye piece adjusted for you. The tube is a solid one piece tube, as you would expect, and the exterior finish is a fairly typical anodized finish that you would see on any number of decent quality scopes. The eye relief on the scope is also generous providing ample room to use the scope on high recoiling rifles without problem, and it appears to cover a wide range allowing for quick full sight picture alignment. Of course, when you pay the big dollars for an S&B scope, the thing you are paying for is the optical quality, and this scope does not disappoint. The optics on the scope are exceptional, and probably the best I have looked through. 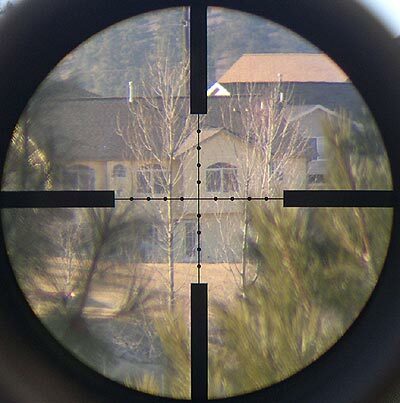 I have said it a thousand times and I will mention it again here, it is extremely difficult to compare optics on modern scopes, BUT, occasionally you will look through a scope and say “wow”, which is what happens here. Of course, I had it side by side with many other high end scopes from Leupold, Sightron, Nikon and others, and there is not any one thing that you can point at say “wow… that is clearly better”, but looking at the picture as a whole, it is better. Is the optics twice as good? No, obviously not. Are they so much better it is worth the extra price? Hum, perhaps if you have the money, but again, it is hard to say, and maybe not. But, all of that being said, the optics are better. This scope has a traditional mil-dot reticule, where as the new USMC adopted scope uses the “Gen-2” mil-dot with half mil hash marks. This good ol’ traditional mil-dot reticule gets the job done though, and it is located on the first focal plane as most European scopes do. This means the mil-dots are accurate at ANY magnification settings. The picture below is taken at 4x where as the picture of the reticule up above was taken at 16x. For those of you that have never seen a first focal plane scope, this clearly shows that the reticule itself appears to shrink and grow with the different power settings. So, you can be scanning the area of operations at any power and can get your mil reading without having to change the scope power. 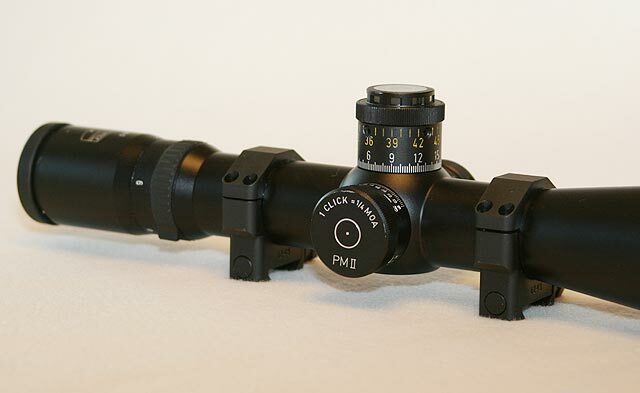 It is a handy feature and even USA based Leupold now offers several scopes with the reticule in the first focal plane. I really do not know why there is a different philosophical difference between hunting and shooting practices around the world, but there is. 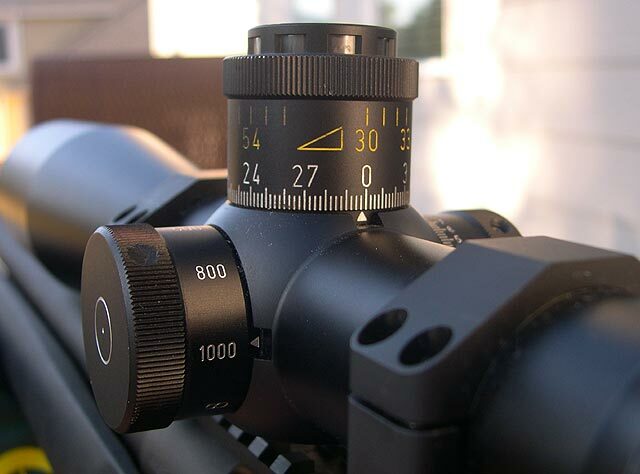 The knobs on the scope are also excellent with a few very notable features that require some mention in this article. The turrets are a larger design that are intended for external use and do not have any dust covers. The ends are knurled for easy gripping and there is a side focus knob for parallax adjustment. The most amazing thing about the knobs is that there is a full 30 MOA of adjustment per single revolution, and that is with 1/4 MOA clicks! Remarkable. This is without having a huge knob like the US Optics ERAK knob and without 1 or 1/2 MOA clicks like the Leupold M2 and M3 knobs. This is quite impressive and allows S&B to offer yet another very unique feature, which is the upper or lower scale indicator. If you look in the picture below you will see a series of “windows” on top of the elevation knob. Well, when you rotate the knob around with up elevations, when you pass the 30 MOA mark, one full revolution, those windows fill with yellow to indicate to the shooter that he/she is now using the “upper” MOA scale marked in yellow on the top portion of the knob. This eliminates the potential of confusion that is so common with long range shooting and forgetting how many times you have rotated past zero. With this combo, the knobs are setup to rotate a total of 56 MOA. I believe the scope actually has more MOA available than that, and when you zero you slip the rings to zero, and then have your 56 MOA of up from there. I do not know what the total elevation MOA may be, but I know that 56 will get a 308 from 100 to well past 1000 yards/meters. The windage knob counts up in both directions and gives you a full 15 MOA in each direction before crossing, which is plenty for all but the most extreme shooting conditions. The windage adjustments are also 1/4 MOA per click and there is an arrow indicating which way is right. There is no indicator for the elevation as to which direction is up, and the direction is backwards from most scopes. Though I suspect you can tell by which way the numbers are counting up, and there are always several numbers visible from behind the scope. Another unique feature is with the spacing on the side focus knob. 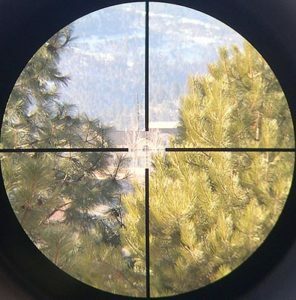 On most parallax adjust scopes, the spacing between the range settings for focus gets smaller and smaller the further you go out. So the spacing is fairly large between 100 and 150 yards, but is extremely small between 300 and Infinity. Not so with this S&B scope, the spacing is the same between 200 and 400 as it is from 800 and 1000. Not to mention the fact that it even goes up to 1000 before going to infinity. 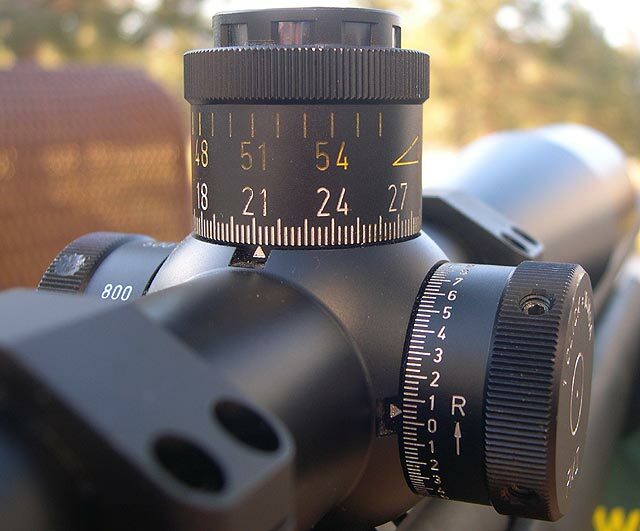 This allows for more precise focus and parallax adjustment at the longer ranges compared to 99% of the other scopes out there that have very small adjustment movement to cover the long ranges. This translates to increased long range focus, crispness of the image, and reduced parallax. Everything about the scope is geared toward long range shooting. Whether it is the Superb optics, 30 MOA per revolution, evenly spaced side focus, indicator windows on the elevation knob, windage markings that count up both directions, or any of the other features, the focus is for long range shooting, and it is an excellent scope for that. With the scope mounted on a remington for shooting evaluations, we were no less impressed. The adjustments were extremely accurate and repeatable and a full and complete sight picture was easily achieved when shooting. I have already commented on the optical clarity and in low light shooting conditions it really helped. The scope shot the box extemely precise and everything functioned as a scope should during all of the shooting portion of the test. Beyond the oddball 34mm tube diameter and maybe no up indicator on the elevation turret, there really is not much else I can find wrong with the scope. But with 34mm rings available and clearly marked turrets that self explain which way is up, those issues are not real issues. So the question remains, is the scope worth $2500? Or what many people always ask, is it twice as good as a Leupold mark 4 or Nightforce as the price indicates? Well, no, it is not twice as good, but neither is a Nightforce twice as good as a Nikon. But, as quality goes up, it takes more and more effort to get the smaller gains, and that is where we are at. It is not twice as good, but you know, it is better, it just depends on what you can afford to spend. These scopes are some of the best that money can buy. Very well written article. Not the usual gunwriter crap. I’ve always wondered why S&B scopes were so expensive and if they were worth it. Your one sentence explained it all: “….as quality goes up, it takes more and more effort to get the smaller gains…”. Most people would be throwing their money away with a scopes like these. But professional shooters (civilian and military) would not be. I guess a good analogy would be buying a Formula 1 for your local clogged freeway. You’ll never utilize the power. But on a track……you will. “Most people would be throwing their money away with a scopes like these.” What-No, people would not be throwing their money away(especially for experienced hunters): First and foremost, if a hunter can benefit with a scope like “these”, how is that throwing your money away. In the real world, it would be dumb to have a scope that can give you a fantastic edge and not be able to use it and better themselves. As a hunter myself, if purchasing this S&B scope will allow me to knock down a 45-65 inch moose at say 900 yrds, without batting an eye, well hell why not use the best technology that is available. Now is the person (who is barley beginning to hunt), purchasing the scope, going to become a sniper anytime soon…probably not, but for someone to say it’s a waste of money for the average person to purchase one is ludicrous.